71 registered members (Atesz792, Amenhotep, 4WD, Astro14, 2015_PSD, 08z06, 9 invisible), 859 guests, and 31 spiders. Last edited by MolaKule; 03/09/15 02:19 PM. tutela transmission gearforce, used in FPT C635 and DDCT (dodge dart), so should be available from chrysler/dodge. Or is another oil specced for the US in the dart transmissions? 3. Honda MTII or MTF 2. 7. Subaru Extra-S Gear & Transmission Fluid carries a GL-5 Rating because it is used in common sump driveline systems. Last edited by MolaKule; 08/11/15 04:49 PM. Here is an updated list of dedicated GL-4 and a few GL-5 MTL's. NOTE: This list is only a �suggested� list of currently known MTFs that may be applicable as a replacement. It is not an endorsement of any one fluid, nor is it implied that any one fluid will cure problems in MTs that have design problems or are worn. The issue of the paper/cellulose blocker rings on the 1998-2000 Tremec T56 manual transmissions was brought up early in this thread. I have a low mileage 1999 so this was an important issue to me when I considered doing a fluid change 3 years ago. I read for hours on this topic with most of it coming from the LS1Tech.com website. What I came up with is that Tremec still only specifically recommends 2 choices for the T56, regular ATF DEX III and Mobil 1 synthetic ATF. This they state because they are the only 2 they have extensively tested and feel confident in approving their use. It doesn't mean other choices can't work well. Others have tried Synchromesh, synchromax, RP, Amsoil ATF, etc. with varying degrees of success. I read a number of blogs describing T56 failures using the higher grade MTL's in the pre-2001 models. I don't recall reading about any failures/problems associated with DEX III, Mobil syn ATF, or the GM MTL. While I would certainly like the beneficial aspects of a higher viscosity synthetic MTL's, I'm not ready to risk blocker ring swelling/failure to get there. At B5 on the list of MTL's GM's Manual Transmission and Transfer Case Fluid is listed. From what I've read, this is merely rebranded ATF (no license renewal on the old stuff), probably to satisfy the need to say they have what you require. GM phased out the DEX III in 2007. And they didn't want you to confuse the often incompatible ATF DEX IV and VI with the old DEX III. I don't know if the newer GM product (#88861800) has the higher % of additives that regular MTL's would have. I would doubt it. Dexron III spec H ceased to exist as a licensed by GM transmission fluid in December 2006 and has been superceded by Dexron VI. Any transmission fluid labeled Dexron III is not monitored by GM so you're on your own as far as the formula meeting the original specs from GM. As noted above and in several tech bulletin, do not use Dexron VI in place of Dexron III unless specifically told to. At this point, p/n 88861800 is the only approved fluid for your transmission. You bring up a number of interesting points. I am not going to read all of the comments on some other blog, but will attempt to respond to some of your comments. A. My information on the paper/cellulose blocker rings on the 1998-2000 Tremec T56 manual transmissions is that they are actually blocker rings of kevlar/graphite/cellulose composites, similar in composition to the clutch disc material in Allison AT's. B. The Tremec series has always been, in my view, a problem child with respect to fluid specs. In some cases, they speced this fluid, while in other cases they spec a different fluid, supposedly with the same internals. Why? My guess is they found that, with their original specs for the higher viscosity fluids, shifting was poor in cold weather, so they dropped the viscosity and at that point in time, the only available fluid with a low viscosity was ATF - which is no longer the case. Why weren't other fluids, such as Pennzoil Synchromesh (9.3 cSt), and other slightly higher viscosity fluids tested? My guess here is that they had some design problems, either due to shifter clearances, or due to cluster gear shaft clearances. At B. 5 on the list of MTL's GM's Manual Transmission and Transfer Case Fluid is listed. From what I've read, this is merely rebranded ATF (no license renewal on the old stuff), probably to satisfy the need to say they have what you require. The fluid mentioned (GM product (#88861800)) is basically a Dexron III(H) fluid with additional AW levels of a phosphate/anti-oxidant chemistry. Others have tried Synchromesh, synchromax, RP, Amsoil ATF, etc. with varying degrees of success. I read a number of blogs describing T56 failures using the higher grade MTL's in the pre-2001 models. I don't recall reading about any failures/problems associated with DEX III, Mobil syn ATF, or the GM MTL. And most of these comments had no definitive cause-and-effect details as to why the trannies failed. Did anyone have their trannies examined by a competent transmission shop and a determination made of the failure? Was the cause of failure due to an increase in engine HP via performance chips, was it due to tracking not covered by warranty, was it due to inadequate maintenance, U-joint vibration, transmission mounts? What? When we were blending, marketing and supplying customers with our own versions of MTF, including a low viscosity MTF (called "MTFGlide," 7.5 cSt (75W80)), and MTL-P (MTL Purple, 11 cSt, 75W85)) customer feedback showed no problems with the Tremec series of transmissions. These fluids had the same AW additives and friction modifiers as did our 75W90 MTF called MTL-R (14.5 cSt, MTL-red). Last edited by MolaKule; 10/22/15 01:29 PM. I run the Tremec TR6060 in my 2014 GT500 on a mix of 1 quart Motorcraft MT-X5-QS (15.6 CST) and 3 quarts Motorcraft XT-11-QDC (6.4 CST) dosed with 1.5 bottles of XL-18 friction modifier. The calculated viscosity is between 7.5 and 8.0 CST and it shifts very well even when cold. The transmission also runs a lot quieter. Molakule, this is all great stuff that I have not run across before. Thanks for posting this. More to think about. Maybe the blocker ring fluid is just a myth. Still, the swelled blocker ring "theory" has to come from somewhere. Most anyone doing a performance upgrade on the 1998-2000 LS1/T56 set ups is going to pull the trans/clutch and upgrade them as well. The weak link blocker rings, 3-4 shifter fork, etc. would be the first to go. If you have any suggestions on early T56's with the cellulose blocker rings I'd more than welcome them. The idea of ATF in my trans has never quite sat well with me, despite the OEM recommendation. The ATF in my car is now 3 years old with 5K miles...car has 17K miles. No doubt a large % of these cars got to 75K-100K on those original transmissions using ATF. My car shifts fine both cold and hot. After changing the 14 year old FF with more ATF there was hardly any difference, if any. The longer term internal protection is what I'm after. 2. ATF or ANY fluid will cause a slight swelling (actually a volumetric increase) of ANY material containing kevlar/graphite/cellulose composites. The questions are: How much and what are the resulting effects? I once did a calculation of the volume increase from ANY fluid and it resulted in less than 0.1%. I.E., take any clutch material volume and multiply it by 0.00093. So why does ANY fluid increase volume? Because a fluid displaces most of the interstitial spaces in the material. If there is any affect, I would think this fluid would tend to "cushion" impacts during synchro engagement. In my view, swelling or volume increase is greatly "overblown,"
and is an excuse for some failures due to design. Last edited by MolaKule; 10/23/15 02:52 PM. We have to be careful about not stating inaccurate assumptions about MTF Friction Modifiers because friction modifiers for MTF's are NOT the same friction modifiers for ATF, are NOT the same friction modifiers for differentials fluids, are NOT the same friction modifiers for MO's, and are NOT the same friction modifiers for tractor wet clutches. Last edited by MolaKule; 12/18/15 02:38 PM. What do the sensei think of this stuff? Googling for "Energear MP" seems to only get returns in Japanese, so it may be a Japan-only product or (more likely) packaging. I'd guess the MP stands for "Medium Pressure". 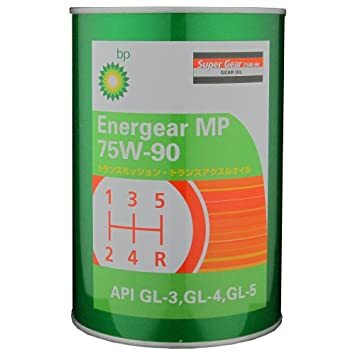 has info on "BP Energear Easy Shift" which MAY be the same stuff, and includes the statement "Particularly suited for manual transmissions in Japanese front wheel drive vehicles." I'll probably be in Japan before the new year. Last edited by Ducked; 01/13/16 10:28 PM. Yes - it is Japan-only and does what it says on the tin. It's a GL-4/GL-5 multigrade transmission oil, targeted largely at the commercial vehicle sector. The "MP" probably stands for "multi-purpose", given its application for synchromesh gearboxes and final drives/rear axles. It will not be the same as the Energear Easy Shift that you linked, because that is only GL-4 rated and has the statement "This product must not be used in differentials requiring an API GL 5 or higher performance level." Can I quote this, just to restate and underline it?! Furthermore, friction modifiers in these various fluids are not the same as in the more commonly-discusses engine oils, where the application is to reduce friction - in a MT, AT, CVT, IVT etc you need to manage friction, which isn't always reducing it. There are cases where you want to increase friction. There are cases where you want to increase friction. in the case of CVT fluids you want a traction coefficient to make sure the belt is in a proper "friction" marriage with the pulleys. So its multi-purpose, AND specified for manual transmissions, but not AS suitable for (most) manual transmissions as a dedicated GL-4 only MTL. Annoying. "5. Ford XT-75W90-QGT (Carries a GL-5 rating as well)"
referred to above as suitable for Subaru's that have (hypoid?) diffs in the transmission. This poses the obvious, but perhaps un-answerable question: HOW unsuitable is it? Its advantage is I can get it off the shelf, plus I already bought a litre. Wasn't very expensive and I took a chance, since I didn't know when I'd be back in Japan. Don't have to use it, though.